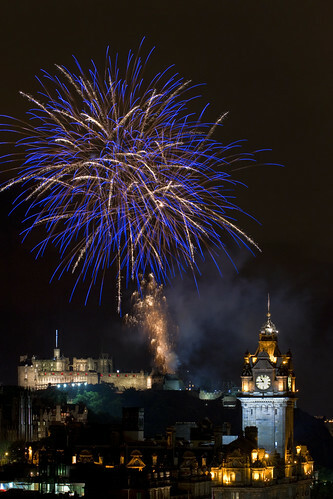 A photographer living in Edinburgh has, shall we say, a good few opportunities at fireworks photography. 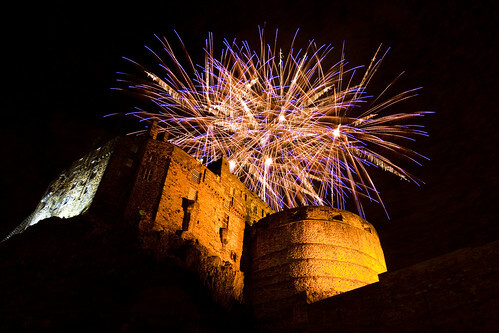 With 22 Tattoo performances each with fireworks at the end of the performance, St Andrews Day, Son Et Lumerie, New Year and of course the huge 45 minute end of Festival display we’re somewhat spoiled for choice. 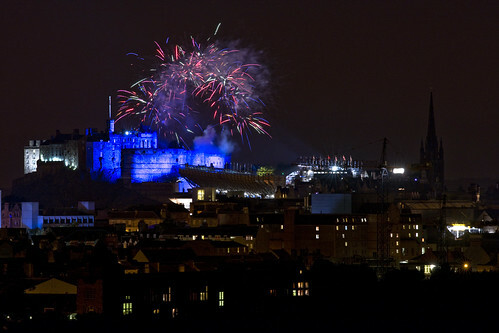 We even had fireworks at midday at Edinburgh Castle this year, a strange experience if I’m honest! So, how do you go about getting the best from all these opportunities? What I’m going to detail here is my method for these shots, this is how I’ve taken the shots below. It might not be how everyone else does it but it sure does the job for me. So what do you need? A camera certainly, a DSLR is best but any camera that you can control the aperture and exposure time will work, we’ll be in full manual mode for this. You also MUST be tripod mounted and using a remote control. If you don’t have a remote and your camera has a self timer set it to the lowest setting (typically 2s) and use that. It’s far from perfect but can be used if you have to. Next job up is planning. This is essential and the key to getting the best shots. Think about where your display is going to be and what vantage points you might have. This year for the Tattoo in Edinburgh I’ve been out in a range of places. Calton Hill, Salisbury Crags, the lower slopes of Arthur’s Seat and right under the Castle in Johnstone Terrace. Each of these requires a different approach which must be planned for. 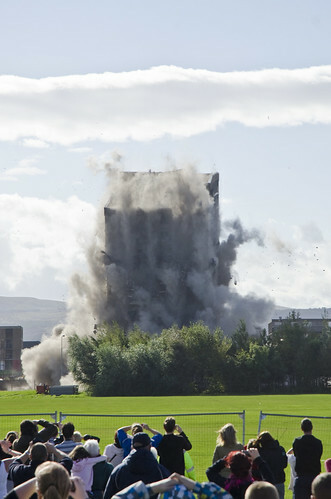 Calton requires a long lens but a shorter zoom can also be handy, Salisbury Crags is similar. The lower slopes of Arthur’s Seat only need the long lens as your so far out from the Castle. Johnstone Terrace meanwhile called for a super wide lens as you can get so close to the action. This is what you need to think about before you head off. Also think about access to the location, how easy is it? Can you get a car in there or will you have to walk? Think about the light, will it be totally dark? You’d assume so but the early performance of the Tattoo on a Saturday night finishes at 9pm and it’s still fairly light in which case you’d be best of facing away from the sunset for the shots where the sky will be darker. Do your research, there will be stacks of info on the net about times of fireworks etc, make sure you know when to expect them and get setup in plenty time. Search sites like Flickr for pointers on locations, you might find a great place you never thought about. This is the hard part really but once you have this info getting the actual shots will be a hundred times easier. Performances like the Tattoo fireworks have an additional advantage in that they are the same every night. You can learn the sequence of the bursts and prepare for particular bursts you know are coming. Once you’re at the location get your camera tripod mounted and your remote hooked up. Decide what composition you want to use, remembering that the fireworks themselves will be high above where they will launch from, in a lot of cases a portrait orientation works best for the bigger bursts, landscape for the lower bursts. Do make sure you have some context to your shots. Get some land interest in them. It gives the fireworks a sense of scale and it will really improve the final image. In my case this is nearly always Edinburgh Castle so it’s easy to work with. I take test shots before the display starts where I make sure the Castle isn’t overexposed and there’s enough light coming in from the ground to show the city. I like to use in nearly all cases, ISO400, f7.1 and an exposure time of around 1s. You can adjust this to get a nicely balanced image. ie, if the ground in your shot is too dark, go up to f5.6, if it’s too light, drop down to f11 or more. Ideally you want to keep that 1 to 1.6s exposure. The further away you are the longer you can chance but at close quarters 1s is more than enough to get big trails and minimise the chance of burning out the fireworks. With the camera set up, the test shots taken, the image looking nicely balanced is all about hitting that shutter at the right time now. Don’t just rattle off shots, watch the display and hit that shutter when you see a nice trail develop. You’ll get a good few shots at it and on the longer displays time to play about with settings. 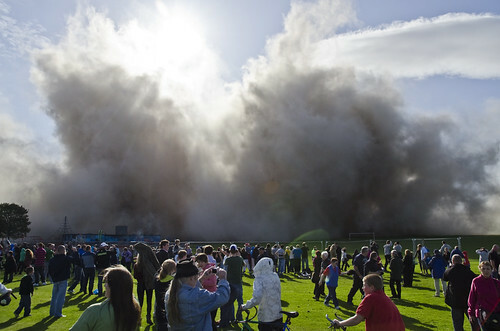 Just don’t panic, keep watching the display and hit the shutter when you think it’s right. Take loads of shots. You’re dealing with a real unknown in fireworks, the more shots you have the more chance you have of that one killer image. Simple as. When it comes to processing fireworks shots you have to be careful with them. If you shoot in jpg there’s not a lot you can do but if you shoot in RAW make use of the fill light to bring out the land element and use the recovery slider to take out any burnt out areas as much as possible. Pay attention to the curves too but above all don’t lighten the image too much. Fireworks are not the easiest of subjects to get right but following these guidelines should put you on the right path, the rest is up to you! 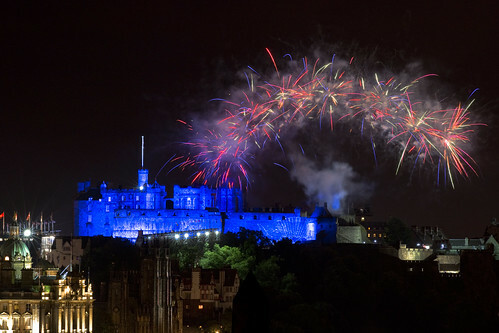 This is the big Edinburgh display and here’s a run down of locations you might want to consider. 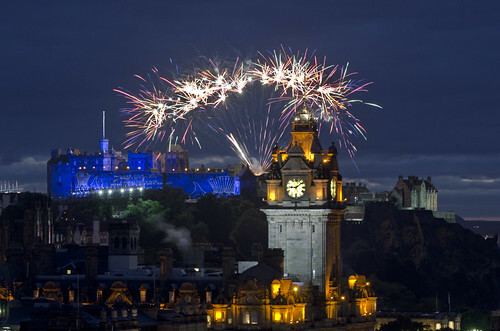 Calton Hill – Iconic views but really really busy. In my opinion, best avoided. Arthur’s Seat – Incredible view from the top, take a long lens. The lower slopes have some good vantage points too, long lens again. 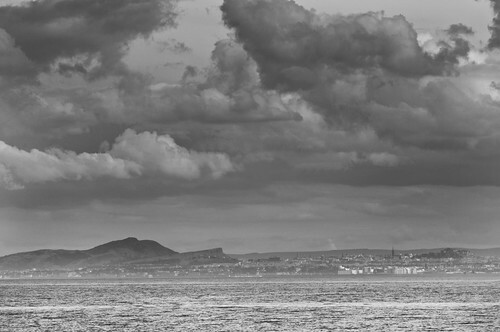 Salisbury Crags – Incredible viewpoint, big and medium zoom’s work well. Can be busy. 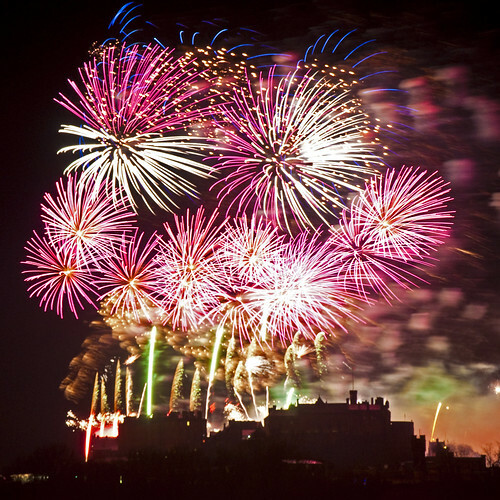 Blackford Hill – Stick to the lower slopes near the observatory, more sheltered and away from the idiots who seem to always be at the top of fireworks night. Get’s busy and limited parking but a great flat on view. Big zoom needed. 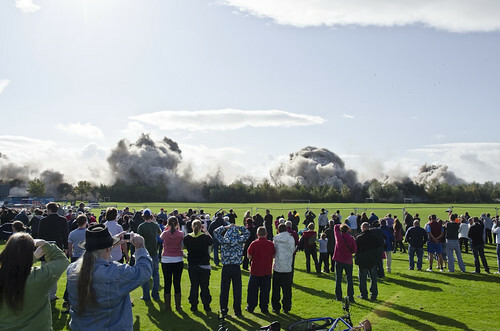 Inverleith Park – Great view of the front of the castle flat on but gets very busy again. Princes Street – Forget it. Simply not worth it. 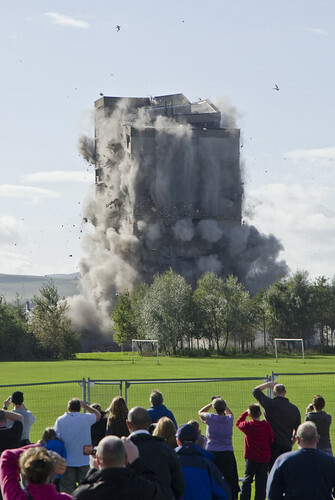 Johnstone Terrace – Can be spectacular but only the biggest fireworks will be in view. Very wide lens works best. Braid Hill Drive, get’s very busy, need to be there very early better off at Blackford Hill. Ditto Braid Hills. Regents Road – Will be busy but nice scenic view over the top of Waverley if you can get a spot. 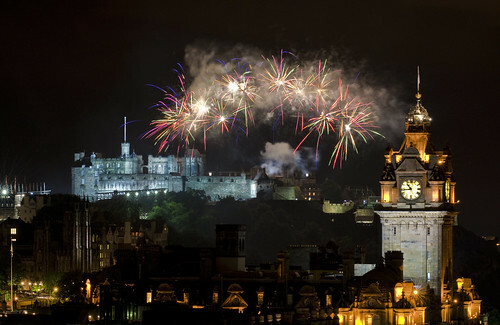 Grassmarket – Will be busy and probably plenty drunks too. Good view though. Kier Street, great view to the castle from here, very close so wide to medium zoom will be enough. Bruntsfield Links – Great spot, very close a wide lens to medium zoom is best. Can be very busy. Here’s a few of mine from the Tattoo this year. 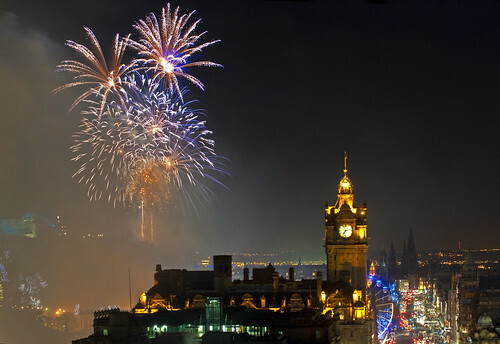 From Calton Hill, this arc of fireworks was good to me this year! 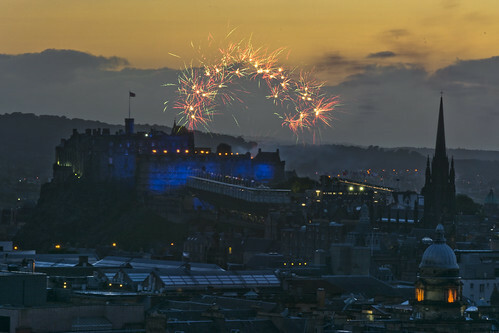 From Salisbury Crags, sunset and fireworks at the same time! 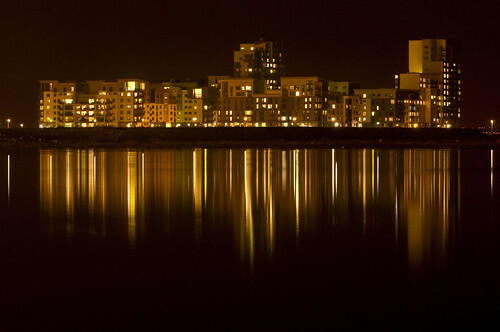 Ocean Terminal is best known in Edinburgh as the last docking point of the Royal Yacht Brittania. If you’re so inclinded you can board the Queen’s cast off boat for a tour down here or if that’s not you’re thing, Ocean Terminal itself is a huge many floored shopping centre with plenty of shops, coffee houses, restaurants and even a cinema to keep most people entertained. For photographers however, there is a much better prize on offer in this unlikely setting. To find it, continue past the front doors of Ocean Teminal and either park in the surface carpark at the far end at the Debenhams or if that’s full there’s the multi-storey right next to it. Just to the side of this is a path named Britannia Walk which runs right along the side of Leith Docks which in iself can be a nice photographic opportunity depending on what’s docked in here at the time. Continue down the walk and you’ll see Britannia docked on your left, straight ahead though is what we’re here for! 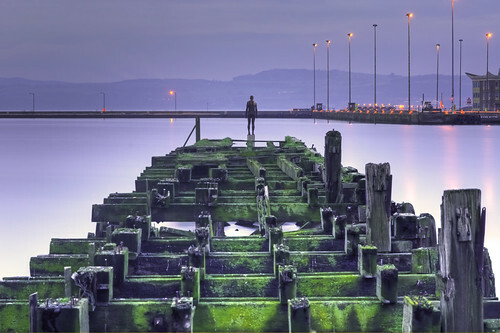 Leading out into the docks Western Harbour is a derelict wooden pier, which in it’s own right is an intersting enough subject but a couple of years back an Anthony Gormley statue (think Angel of the North) was installed at the end of the pier as part of the Gormley 6 exhibition which placed 6 statues of the artist at strategic points along the water of Leith with the last one being situated here. This area can be a magnet for local photographers so don’t be too surprised if you’re not the only one here with a camera. 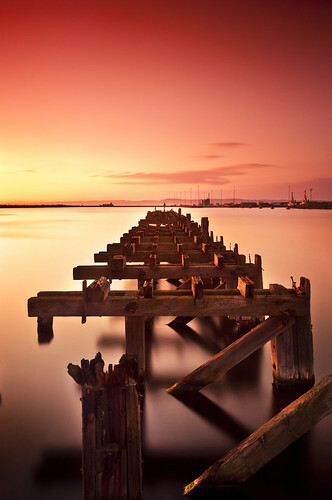 The pier itself isn’t great for access as it’s in a very deep section of the docks and the only option of a shot of it is over the railings which isn’t a great hardship here. It’s ripe for long exposures but do watch out for light reflection up of the shiney railings which will be under your lens which can have an effect on images. 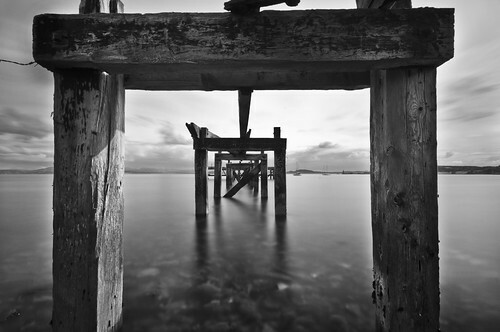 You can shoot this pier in a variety of ways some of which are showen below. While you’re here though, take a look over the harbour to the flats on the other side, these make a great shot in still conditions, especially at night. You might also be lucky enough to see some of the cruise boats that visit Edinburgh in here, not the bigger ships as they dock typically at Hound Point at South Queensferry but some sizeable liners and naval vessels make regular appearances in here too. Again, it’s a nice shot for sunset in summer, late May to August typically being the best time to attempt this shot. 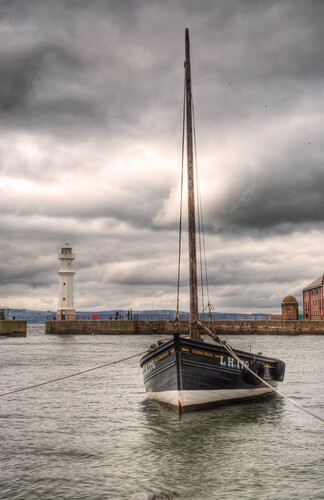 Newhaven Harbour is one of these undiscovered gems that 9 out of 10 tourists will never find with they visit the city which is a pity as it’s one of the most attractive areas along the Edinburgh coastline. 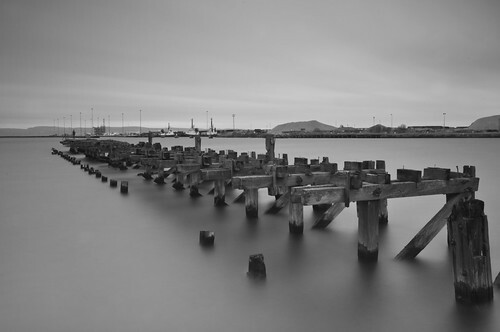 Situated just to the east of Leith Docks and west of the larger Granton Harbour this small harbour provides a wealth of photographic opportunities. Getting to Newhaven is easy; simply head along the A901 which hugs the Edinburgh coastline, if the Firth of Forth is on your left coming from the west of the city or on your right coming from the east then keep going and you’ll eventually find it. There’s lots of free parking in the area, either in the free bays along Starbank Road to the South of the Harbour or if you turn hard left just part the harbour and follow the road around you can park on the cobbled area right next to it. 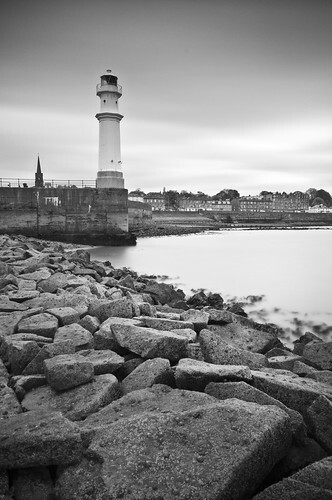 By far the most striking feature of this small harbour is its lighthouse. One of the best and most accessible local examples you’ll find in this area. You can walk right out to the base of the lighthouse and it’s hard to take a picture of Newhaven without if featuring in some way or another. 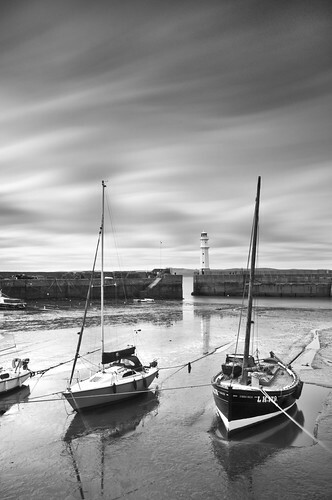 At low tide the harbour all but drains of all it’s water creating plenty of opportunity for long exposure shots of the boats as they beach on the harbour’s muddy bed. At low tide to the north of the lighthouse the large jaggy rocks of the sea defences are exposed and a bit of careful exploration can take you over the seaweed line right down to the rocks for some dramatic shots up to the lighthouse. 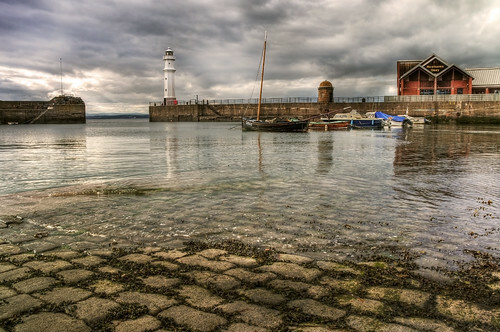 At high tide the harbour fills up quite a way and the water will come quite far up the cobbled slipway which is again a popular shot with local photographers. The boats themselves at the harbour are mainly leisure boats but there is a mix of working boats in there too although you don’t that often see many boats coming or going from here. You can get pretty unrestricted access around the north, west and south edges of the harbour, only the eastern edge is restricted access. At low tide if you’re careful you can pick your way around the seaweed covered walkway at the bottom of the slipway right around to the lighthouse, be warned though, it’s exceptionally slippy! 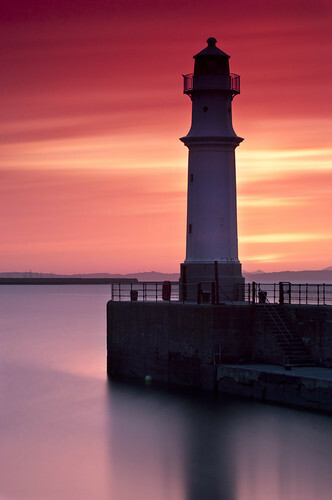 Newhaven is one of the best locations in Edinburgh for a summer sunset; the sun comes down over the Firth of Forth giving ample opportunity to photograph the lighthouse or boats at sunset without any other objects in the way of the sun. This is one of my favourite locations in Edinburgh and one that I visit often, especially during the summer months. Below are a few examples of shots you can expect to take away from Newhaven. 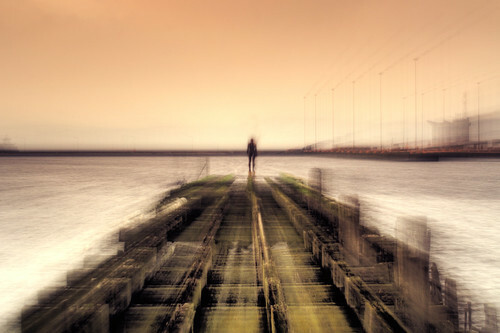 This is one of those locations that just begs to be given the long exposure treatment. 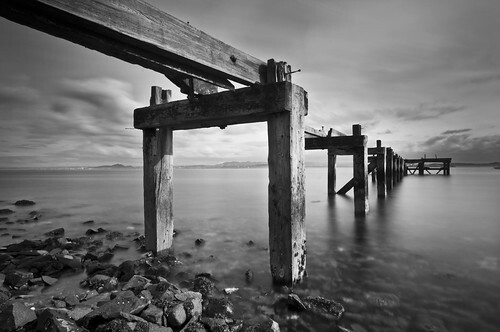 The Scottish coastline is littered with these old piers if you know where to look for them and they make fantastic subjects as they age and deteriorate. This particular pier gave me some amount of issues trying to find how to get access to it but once you’ve found it it’s really rather easy! Arriving in Aberdour from the East drive though the village and you’ll go past the railway station which is on a large S bend. Around 100 yards on your right from there you’ll see signs pointing to Silver Sands down Hawkcraig Road. Follow the road down until you arrive at a large car park. Drive to the far end of the car park and park up to the left where you’ll see an opening in the trees. Walk though here and turn immediately to your left and follow the road. After a very short walk you’ll get to a little fork in the road, keep left and walk down the very steep hill towards the houses at the bottom. Continue along the little gravel lane and when you come out from between the houses that’s you at your destination! The beach here is all medium sized loose rocks, a bit tricky to walk over to make sure you exercise some caution which approaching the pier. When I visited here, it was about an hour before high tide and it was a pretty good guess at a decent time catch the subject. You have good access all round and indeed even underneath the pier so you can get shots from a good range of angles. 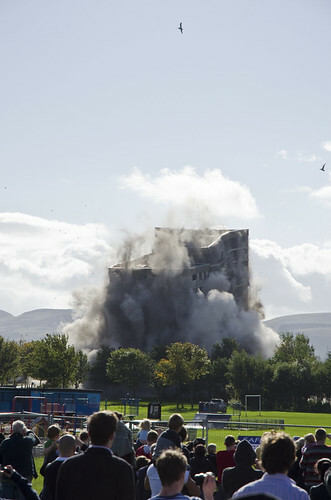 While you’re here don’t forget the view you also get of the Edinburgh skyline where you can clearly make out landmarks such as Arthur’s Seat, Edinburgh Castle, the Hub spire, St Giles bell tower and the Balmoral Clock. 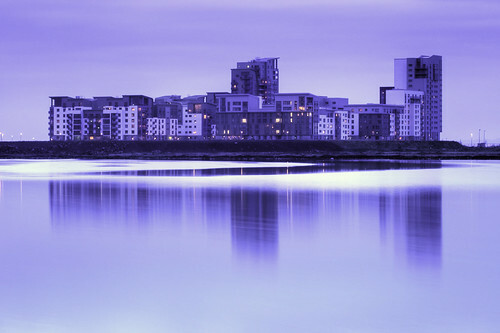 A range up to around 200mm will get you a reasonable shot of Edinburgh from here. This location is also interesting for the views of the various little islands dotted around the Firth of Forth including Incholm and its Abbey and the “back end” of Cramond Island. Again, a longer lens will let you get something of them from here too. This location is best for sunsets in the winter, in the summer the sun sets off up to your right over the harbour. All in, a nice location with loads of potential if you find yourself over on the Fife coast!